Communication is so easy and immediate these days. Texting, tweeting, facebooking. Who needs a landline anymore, or regular old snail mail? Even email seems quaint! When my husband left for Texas, he suggested that we email each other back and forth, in addition to texting. It made sense– we could share so much more in an email–things that weren’t urgent or on the fly. One of my favorite things about e-mailing is that I find it easier to express myself in writing, to say the things that I find it hard to say out loud. What I didn’t expect was that waiting for an e-mail from him would be like waiting for a letter to show up in my mailbox! We are both so busy, and a long e-mail full of updates and the little things we share with each other means that we have to find time to sit and write the e-mail. I find myself waiting in anticipation for a e-mail response from him. It’s kind of like the early days of our relationship, when I couldn’t wait to see him again and felt giddy at the prospect of it. It’s the same feeling I used to get as a kid when I had a pen pal, never knowing when the letter would show up, and wondering what the letter would say. To this day, I love checking the mailbox and wondering what surprises it might hold for me. Of course, as a grown-up, I’m more likely to find bills and other boring stuff but every once in a while, I’ll get a package I forgot I was expecting or a new book to be reviewed. In this age of instant gratification, there is something to be said for slow communication, to have no choice but wait for a response, to have something to look forward to, to know that whatever response you get, it wasn’t off the cuff– someone took the time and care to craft a letter and share their thoughts with you, to make your day a little more special. And so I wait for my husband’s response to my latest e-mail. Whenever it comes, I know it’ll make me smile. This post was inspired by The Mapmaker’s Children by Sarah McCoy, a novel about two women connected by an Underground Railroad doll. 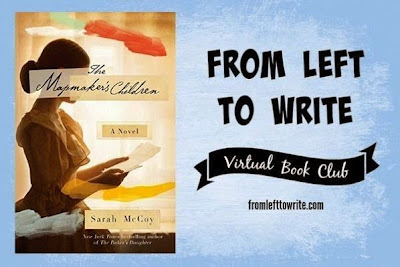 Join From Left to Write on May 19th as we discuss The Mapmaker’s Children. As a member, I received a copy of the book for review purposes.This post contains affiliate links. I think it's sweet that you and your husband do this for each other. We were long distance about 7 years ago but even then didn't email each other much, preferring long phone calls. I kinda wish we did though as I'd have those emails to look back on now. My husband and I spent 9 months apart back when we were dating. We could have saved so much money on calling cards if we had texting! My husband isn't big on email but he does text. Glad you're able to stay in touch in more than one way. Letter writing is a lost art. You can't much tuck an email into a box of mementos, can you? (well, you can, but it isn't the same). I love writing honest to goodness notes with a favorite pen. I think about this idea often, as I find so much comfort in old letters not only from my childhood and teenage years, but also from generations of family who are now gone. This book definitely made me think of how special those boxes of letters really are! I think long phone calls are nice! Email is our default because I'm hearing impaired, and my husband is not a great phone person anyway. Yes, it's so much easier these days. Imagine having to wait for mail or a telegram or just hoping he'll be home when you call. It's so fun to get snail mail from your friends, and to send it too. And maybe the rarity makes it even more special.